Perfect for quesadillas, pasta, salads, sandwiches, pizza and more, Sweet Basil Sausage can upgrade any recipe. Made fresh without gluten, MSG or preservatives, you’ll feel unashamed when you make Premio Sweet Basil Sausage the star of a family meal. Try something new, or add it to the recipes your family already loves. 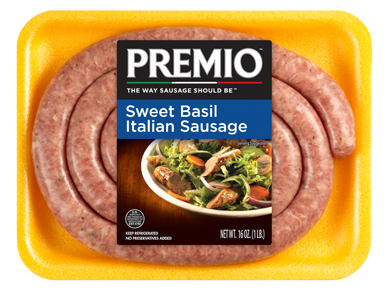 Don’t wait to try Premio Sweet Basil Sausage. Ingredients: Pork, Water, Less than 2% of the following: Salt, Sugar, Spices (including fennel, black pepper & basil), Potassium Chloride, Dehydrated Garlic, Natural Flavors, Extractives of Paprika. Heat a pan to a medium temperature. Add 3 tablespoons water and place links in pan. Cover the pan, continue heating for 10-12 minutes, turning the links often. Remove cover and continue cooking for 15-17 minutes or until golden brown. Serve and enjoy! Always cook sausage to a minimum of 160° F.
We take our famous fresh sweet sausage and add a dash of basil, easily making it a family favorite! Why does sweet basil make our sweet Italian sausage that much more delicious? Well, you may not know it, but basil is practically a magical herb! Here are a few facts you may not know about this delightfully leafy green accent to your favorite Italian treat. Ocimum basilicum, commonly known as basil, is a beautiful, fresh green herb that has been called the “King of Herbs.” In fact, the name “basil” comes from the Greek for royal plant, although many believe it is native to India. Basil has a strong and sweet smell, and basil-flavored Italian sausage is a traditional Italian delight that has been enjoyed for centuries. Sweet basil itself has been around even longer than that. In fact, some records suggest sweet basil was used in China in the Hunan province over 1,000 years ago! People have historically thought of basil as having medicinal properties. One of the reasons it’s called the king herb, or royal herb, is that it may have been used as royal medicine. One herbalist proposed basil could protect one from the pain of a scorpion’s sting, while some studies suggest the essential oils in basil may serve as an insect repellent. Of course, when it comes to our Premio sweet basil Italian sausage, we don’t concern ourselves with any of that — we just know it tastes great! That being said, basil, which pairs well with tomatoes, onions, garlic and olives, does have some health properties that may interest you. It stimulates the appetite and helps control gas, so go ahead and help yourself to an extra sausage! Other herbs that go well with basil include oregano, rosemary and sage. Pistou, a well-known Mediterranean specialty, is made by grinding basil with garlic and olive oil into a paste. The better-known Italian version, pesto, includes pine nuts and grated cheese in the paste. Not all basil is the same. The basil we use in Premio sweet basil Italian sausage is just that: sweet basil, also known as Genovese basil. Other varieties of basil include lemon basil and holy basil, but they don’t provide the tantalizing aroma and sweet Italian flavor we want our basil-flavored Italian sausage to have. And just because it’s a great Italian sausage doesn’t mean you have to make an Italian meal! The Premio Fresh Sweet Basil Sausage makes a fab quesadilla pie once combined with rice, beans, cheddar and Tabasco. Want something light and refreshing? Try a delicious and crunchy Strawberry Spinach Salad made with Premio Sweet Basil Sausage and glazed pecans, which are sure to get those taste buds singing. And of course, if you’re looking for an Italian specialty, the Italian sweet basil sausage works wonders with pasta. Use it to make good-old delicious Spaghetti Bolognese, Ravioli or a Warm Sausage Saladini the whole family will enjoy! How Do You Love Premio Sweet Basil Italian Sausage? These are only a few of the countless ideas for what you can do with our delicious sweet Italian sausage with basil. The possibilities are only limited by your imagination. Use our store locator to find where our sweet basil Italian sausage is sold near you! Here’s how we recommend you cook your Premio sweet Italian basil sausage for a filling, delicious meal for the whole family every time.